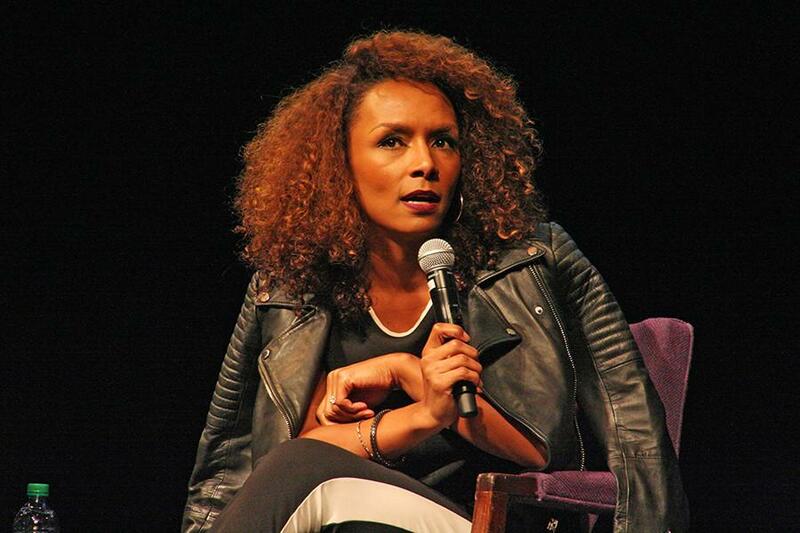 Janet Mock addresses an auditorium of NU students Tuesday night. As the speaker for a Multicultural Student Affairs event, the transgender journalist and activist spoke about her experiences with LGBT visibility. Author and activist Janet Mock discussed privilege, visibility and inclusive representation as well as her work as a journalist and transgender public figure on Tuesday. The Multicultural Student Affairs office organized the event, held at Cahn Auditorium, in partnership with the Medill School of Journalism, Media, Integrated Marketing Communications, for Queer and Trans Empowerment Month to raise awareness of LGBT issues. “For me, writing (my memoir) ‘Redefining Realness’ was, on a personal level, a way to validate and affirm the fact that I deserve to be heard and that my story deserves pages,” Mock said to an audience of more than 150 people. Although Mock said there are more transgender people in the public eye than ever before, she noted the discussion of transgender issues still tends to exclude non-binary and non-gender conforming people, and some transgender people are still more privileged than others if they can “pass” as being cisgender. When asked how she balanced being both a journalist and activist, Mock said the two are not mutually exclusive. Mock, who was raised in Hawaii, moved to New York as a “fulfillment of a dream” in her 20s to work as a journalist. She had transitioned as a teenager, but did not come out to her coworkers as transgender immediately, she said. During the event, Mock spoke about the hardship she experienced as a black transgender woman in the workforce and as an activist. Although she encountered prejudice and insensitivity, she also found a sense of community with other black women as they helped one another write resumes and cover letters, since they all celebrated one another’s successes. Although Mock has been out as a transgender woman for years, she said some people do not feel comfortable or have a safe environment to disclose information about their gender or sexuality, and that such hesitation is understandable. Medill senior Bo Suh, co-president of Rainbow Alliance, interviewed Mock. Mock is Northwestern’s latest transgender speaker: In April, actress Laverne Cox spoke in a packed Pick-Staiger Concert Hall in a talk sponsored by A&O Productions and Rainbow Alliance. JT Snipes, a Chicago resident who attended the event, said he appreciated Mock’s comments about being a black woman. Mock said that as transgender issues receive more visibility, transgender people should continue to shape culture. “So Popular!,” her show on MSNBC, has allowed her to talk about these issues with a social justice and feminist lens, she said.